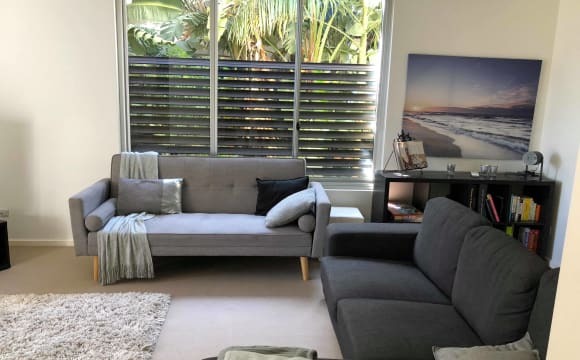 Our home is beautiful and well located in popular St Kilda/Elwood which is lined with great little cafes, restaurants, bookstores and boutique shopping plus many gyms and yoga studios, the Beach and parks. The location is Great and central to the city of Melbourne. The room is FULLY FURNISHED. 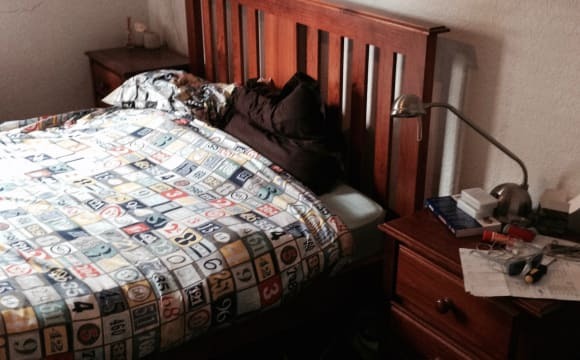 Single bed from Ikea, beside table, large built in wardrobes, desk. The room is quiet, and receives a lot of nature light. Our home is open plan, with polished floorboards. The kitchen is modern, with modern appliances. The bathroom is spacious. There is lots of natural light and great views of The St Kilda Botanical Gardens. Close to ALL public transport including the train, tram and bus services. This is a our "home" and not a share house. You would be living with a great married couple and two friendly cats. Looking for an International Student or Interstate Student only. Please - No Couples - No WHV - No Backpackers. This is a wonderful property! Located directly across from the beach. Gorg cafes and restaurants close by. Public transport a small walk away. The house is fully furnished, apart from the room available. There is storage, heating / cooling and internet available. My cocker spaniel may also visit from time to time. 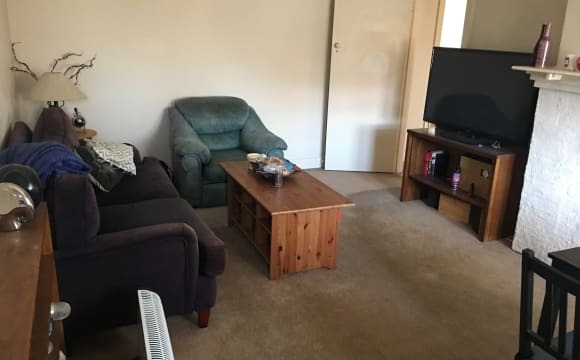 Calm and comfortable just one block from Elwood beach and canal and close to the shops and public transport. 2 Bedroom 1 bathroom and a living room in an amazing location. This place is amazing!! I found it and knew straight away that it was home, quite a special place. Its humongous, high ceilings, huge open plan living space and a massive sun room that lines the front of the place that could possibly be a spare bedroom for guests if ever needed (it looks over the cafes on Ormond road). Faces north so the flood of light makes the home a very happy space. The flat has a big private outdoor space that is currently being redone that will make a great entertaining area - thinking of lining it with some fake grass :) This place is going to be a lot of fun to decorate! Split cycle aircon/heating. Only minutes walking down the beach and coffee shops on our doorstep. Move in date for the both us is the 15th May. I'm looking for someone that has a positive vibe about them and is also very relaxed and drama free, has their own life going on but would love to hang out and watch some trashy tv every now and again. Over the age of 25 would be great. Someone who is naturally quite clean so we can share the load. Would be a bonus if you could contribute to some of the furnishings! Not a party house. More photos to come. Amazing location! 1 block from the beach and close to Elwood shops. It is a 2 Bedroom apartment, 1 shared bathroom, huge kitchen and lounge, and a balcony overlooking leafy Addison street. The apartment is in a quiet and calm building, on the top floor. The bedroom will be unfurnished, however i've provided photos of it furnished and unfurnished. The rest of the apartment is fully furnished. This property is fantastic because it is walking distance to trams to the city and Balaclava station. It is super close to Carlisle street, amazing cafes and bars, St Kilda beach as well at St Kilda Botanical Gardens. I am looking for someone to stay for a fortnight in my room while I am overseas on holiday. Our apartment is a beautiful period style home in a quiet street lined with wondrous plane trees close to every convenience. A beautiful little spot, with a small courtyard/garden which makes it lovely to sit outside in the summer. The apartment building has secure access with a swipe key, and is very quiet. 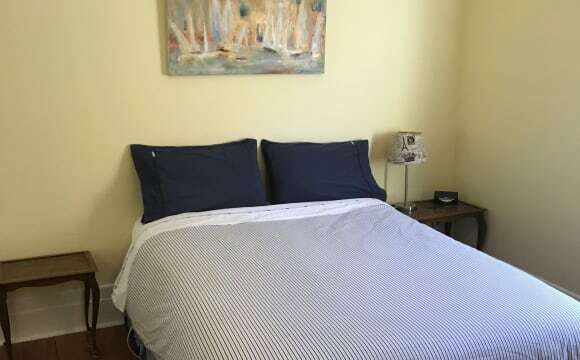 The room (pictured) is generous in size and available for someone to move in any date between early May - early June. The apartment is air-conditioned. 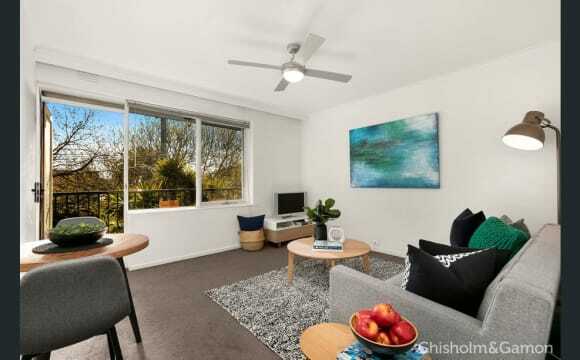 Beautiful newly renovated light filled art deco apartment in a block of four in Elwood. High ceilings, timber floorboards and quality finishings. Fully furnished except for the bedroom advertised. The area has beautiful tree lined streets and is equal parts quiets and bustling. Literally five minutes walk to Elwood beach. There are several cafes &amp; restaurants at the end of the street (two minutes away). You can easily walk to Acland street &amp; St Kilda (ten minutes). Ten minutes walk to the tram and train - Sandringham line. I am going overseas for 3 months (exact date not yet set, but approx. 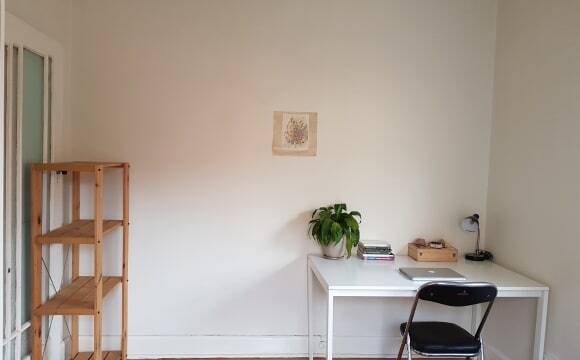 early July) and looking to sublet my fully furnished, modern, quiet apartment in stylish Elwood for 3 months. I will put my personal belongings in storage, so you will have a fully furnished (incl kitchen) apartment to yourself. 1 bedroom plus study, balcony, large shower, AC, heater, Fetch, bills (within reason) and unlimited wifi included. First floor in a secure building, option for underground parking. Close to public transport, cafes, parks and the beach. Not really suitable for dogs; cat might be considered, but there is no outside access besides the balcony. No smokers please. I will ask that you look after the pot plants! :D I will continue contributing to the remainder of the rent, so this price is a bargain! Being in the property industry, I am very fussy on where I live. This place is honestly the best apartment I've had in Elwood and I never want to leave. It is 1 of 8 in the block and literally opposite the beach. It is positioned at the back of the block which means the road noise isn't too bad. It is a 2 bedroom, both with their own ensuite! It also had an additional powder room for when guests visit. North facing so it gets sun all day and also has a balcony with a BBQ. Reverse cycle air con in both bedrooms and the living room too. Separate laundry too. Honestly it is the ultimate apartment for two people to live independently. The room available comfortably fits a queen sized bed with two bed sides + a chest of drawers if you needed them. 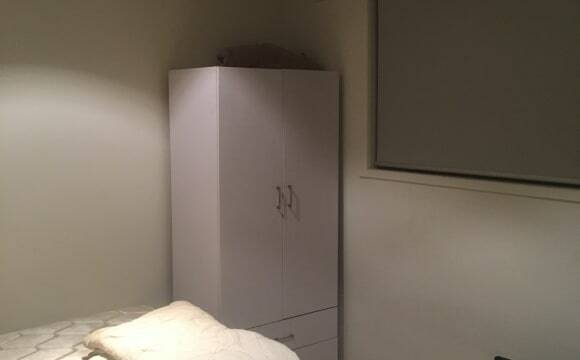 It had a built in wardrobe and there is an additional wardrobe just outside the bedroom if you need extra storage. Parking is available on the street, unfortunately no visitors spots in the complex. Wifi connected and will be $30 per month + other bills all split 50/50. The apartment is fully furnished, you would just need to furnish your room. I have every kitchen appliance under the sun for you to use as well as all the kitchen basics. If you had a dryer, that would be an added bonus as mine has decided to stop working just as we head in to winter. Lovely older style brick house. Quiet dead end street with permit parking at the front gate. Large bedroom with polished boards with large built in robe with shelves and draws in one end. Furnished with bed and desk. Can supply linen if required. Electric blanket and heater for those cold winter nights. Leafy backyard great for bbq's. 12 mins walk to Acland St. 15mins walk to Elwood Village. Bus stop 3 mins walk. Need to enjoy living in a clean tidy house. Very quiet location with access to everything within minutes. Large main fridge with 2nd fridge outside in laundry. Washing line (under cover) and dryer available. Unlimited wifi for small additional cost per month. Need to be at least 30 years old. Spacious top floor apartment filled with sun light. The apartment has ducted heating for winter and air conditioning for hot days. Massive lounge with big screen TV and netlifx. Separate kitchen and separate toilet. Heaps of storage! Your room comes furnished with double bed, build in wardrobe, extra shelves for decoration and it's ready for you to move in! Situated in a quiet street steps away from St Kilda Botanical Gardens and a short stroll to trams to the city or the restaurants, cafes and bars in Ackland St. Please note ; Your share of the Bond is $1043 and one month rent is $1043 so first payment will be $2086. It all goes through Gary Peer real estate agency. Very spacious ground floor apartment in front of St kilda botanical gardens. Entrance hallway, separate kitchen with table and chairs, separate toilet, separate laundry, separate living room with balcony. 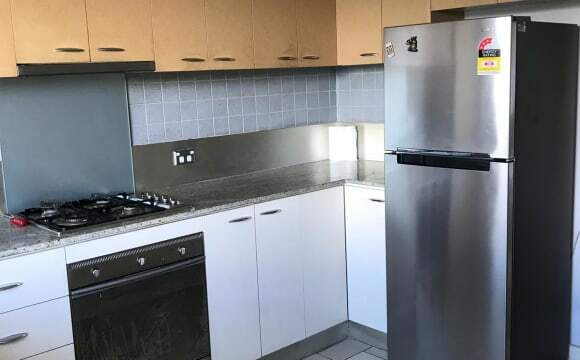 5 mins walk to the tram 96 5 mins walk to Coles/Woolies 7 mins walk to tram 67 (st kilda road) 10 mins walk to St kilda beach 15 mins walk to Elwood beach Ideally looking for someone with who I can make this place our home. Would like to get to know my housemate and potentially have a beer every once in a while. I do enjoy my quiet time and go out rather than having people over.